This is the first of a new mystery series written under a pen-name, from a well-known archaeologist [who regularly appears on television and radio], so is well-equipped for the task of uncovering the mysteries of the past. The setting is the Marlborough Downs where the protagonist, Clare Hills, worked as an undergraduate on the excavation of an ancient barrow cemetery. She has recently been widowed after a happy marriage to a wealthy banker. A friend from her student days [Dr. David Barbrook], has invited her to help him sort through the records of famous archaeologist Gerald Hart, who died before he could publish the results of the dig at the fictional Hungerbourne. David's idea is that the archaeological work will help her through her bereavement. Gerald Hart's own official notes of the dig were lost in a fire at the dig house. A number of very fine grave goods were excavated, including an exceptional gold sun disc. These finds are now in the British Museum. Clare arrives in Hungerbourne and meets David in the Manor House, where he is staying at the invitation of Gerald's son, Peter, who is now a big man in the City. David is sorting through Gerald's untidy papers in the study when he notices how greatly she has changed; how elegant her appearance is, and concludes that she must be a very wealthy widow. He says Peter has told him there is more stuff in the attic, and suggests her first task should be looking through that. Clare climbs rather gingerly up the ladders to the attic, and the first thing she sees is a line of packing crates marked HUNGERBOURNE BARROWS. She has found the supposedly burnt dig records straight away. The story then takes off at a fast pace. There is a photograph in the manor of the original digging team, which includes David and Clare, Peter Hart and his friend Ed Jevons, and some young women. David and Clare go to the British Museum to meet the curator of British archaeology. They study the gold objects from the barrow, including the beautiful sun disc. They then learn that a second sun disc was found, a pair to the other one, but slightly damaged. It was found by Ed Jevons' farmer father when he was ploughing and he had intended to donate it to the British Museum, but it was now lost. British Heritage, when hearing of the new developments, agree to fund a new dig. When it gets under way, the first sensational find is a Bronze Age Funerary Urn containing the bones of a local chieftain, but underneath is a collection of burnt pieces of bone – a secondary burial which turns out to be modern. 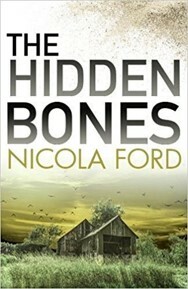 From this point the plot has three main elements – the murder (the bones in the pot and the missing disc) – the threatening graffiti all over the dig house using the old name for Hungerbourne, Woe Waters, which culminates in further murders, and the romantic element between David and Clare, which never quite materialises. Then there are a number of secrets from the past that come to the surface (literally). It all makes for an entertaining, and absorbing read.